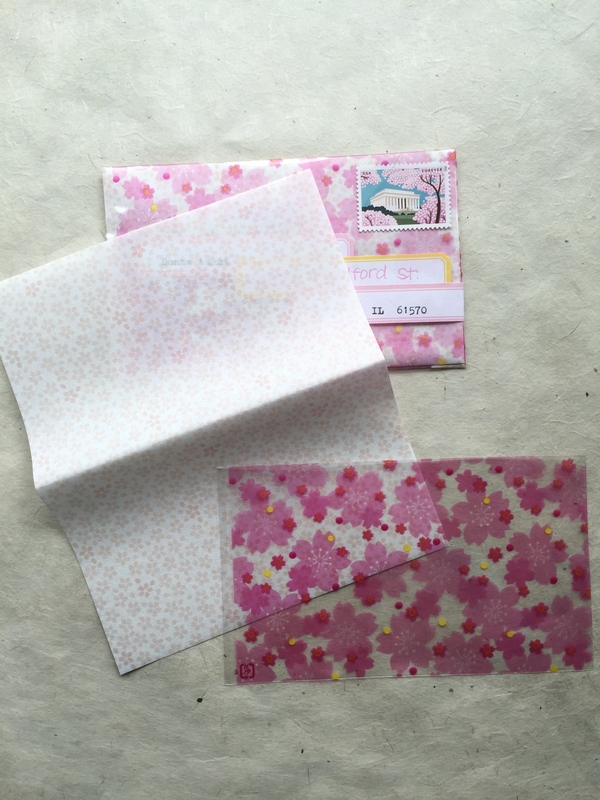 I’m a bit late for cherry blossom season, but last week, I sent out some pink blossomed mail to a few pen pals. What can I say? I’m inspired by those postage stamps. When we were in Japan last year, I picked up a bunch a sakura stationery and of course I tucked it away to use this spring. I wrote letters on the kaishi papers, folded them around a Japanese tea bag and tucked them inside these sakura printed cellophane flat bags. The tiny sakura flowers on the papers showed through the bags…flowers everywhere! I sealed up the bags with washi tape and used labels for the addresses. Easy! I got a bit behind last week on the Write On Challenge and National Letter Writing Month but I’m all caught up and looking forward to finishing strong. I can’t believe April is almost over! How has the challenge gone for you? Very lovely mail! 🙂 Thanks for sharing!